Everyone should stand up and applaud the actions of Boss Tuneage records. 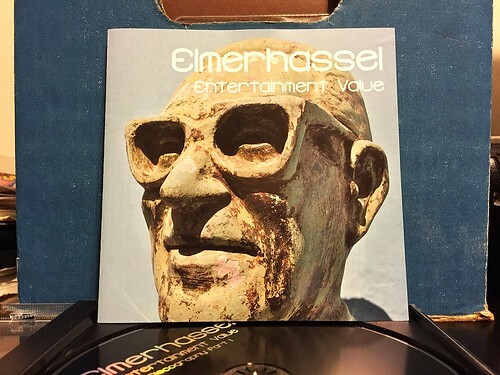 The fact that they stepped in and blessed this world with a two part Elmerhassel discography is the sort of thing that deserves having a statue erected in their honor. This is the very definition of a band that could have just fallen through the cracks and been forgotten. I never had much in the way of Elmerhassel records apart from some comps and a 7", so even I hadn't given them much thought until I saw that these discography CDs had come out. Getting to listen to all of their songs compiled together, I've really gained an appreciation for just how great they were and how seriously they've been overlooked. The first volume of this CD set contains the Honour Your Partners mini LP, The Billyous LP, a 7" and 2 compilation appearances. Melodic punk is probably the best genre definer if you really need one for Elmerhassel, and they're just as good as the best bands playing this sort of thing. I immediately think of other UK bands of the era. You can hear a bit of Mega City Four, a little Senseless Things and some Midway Still churned in for good measure. The pop is every bit as catchy as any of those aforementioned bands and Elmerhassel really had an incredible knack for constructing some seriously catchy tunes. The only thing, and really this is the only thing, is that there are a handful of cover songs I'm not as into. I don't really need to hear another cover of "Big Yellow Taxi" at this point, but I will cut them some slack as it was released in 1992 after all. If you have even the most fleeting interest in 1990's UK punk rock, this is absolutely essential. Snuff and Leatherface made the biggest name for themselves in the US, but there are a whole pile of other great bands that came out of that time. Elmerhassel sits very much at the top of that pile.